We take care of all your flyer printing needs. Our speciality lies in express flyer printing where we can print and deliver your flyers in a day’s time upon confirmation of order. All the flyers we produce are of superior quality and great value, which you can conveniently order from the comfort of your chair. You choose the size, number and type of flyers you need, and it’s our duty to have it ready for you on your requested delivery date. We offer both one side and two sided flyer printing options, with a glossy, matte or plain finishing. 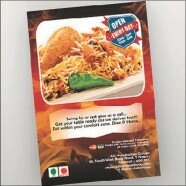 We have the equipment and capacity to print as few as 50 flyers, to as many as 100,000 flyers, as per your necessities. We offer flyers in standard A4, A5, A6 and A7 sizes, and can even customize the size if needed. Of course, we offer both coloured and black and white flyers which you can choose to print on a wide variety of paper types. If needed, we can also laminate your flyers and have them delivered to you. Besides this large choice of express flyer printing options, we take pride in the fact that our team of experienced professionals emphasizes on offering great customer satisfaction to all our customers.